Hello there and thank you for stopping by today. Today is the first day of the MFT July Release Countdown. Only 5 days until the new release (yay)! Be sure to head over to the MFT Blog for full set and die reveals for the day. This release is packed full of gorgeous new products that I have SO enjoyed creating with. 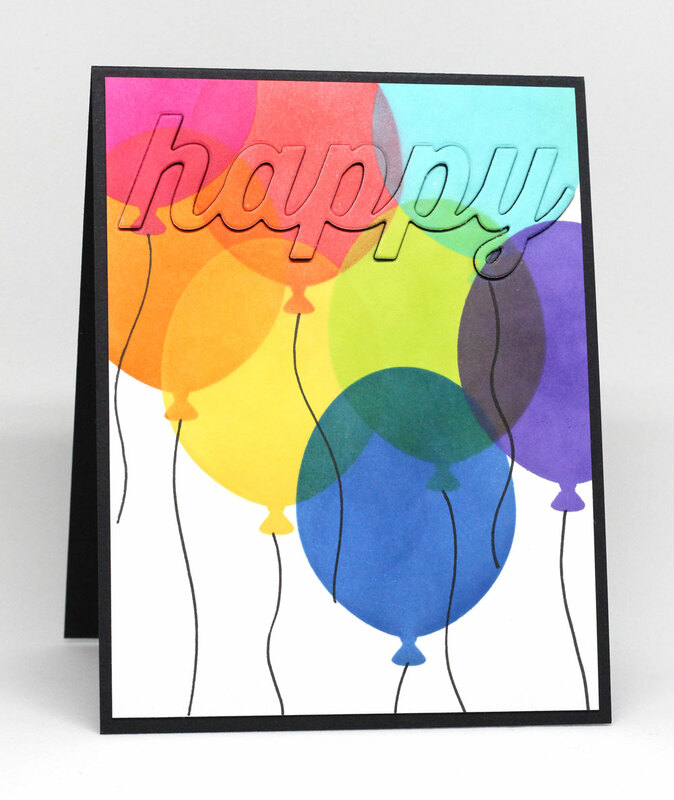 My card today features the new Big Balloons Stencil. It contains 5 awesome balloons that can be sponged through. I just love the idea of sponging colors over one another for a realistic balloon bundle look. I used the Big Balloons die strings and created a "stencil" using the negative die cut, and then I drew in the strings using a Copic Multiliner pen. The "happy" was die cut and boosted up with three layers of black card stock. These products and many more will be available for purchase in just 5 days, on July 5 at 10 PM EST. Be sure to check out the MFT Blog to see what the rest of the team has come up with today. Love the colors of your card. I saw your card and it took my breath away -- gorgeous!! Love how the colors overlap. What pretty card. Love the fun overlapping of balloons and the pop of the sentiment!! Love the bold look of this card. The see-through balloons are the best! This is stunning! Love the way you've used the new products, Jody! love the overlapping stamping, so cute! Great sponging ... I love the colors! I love the overlapping balloons. They look so festive! And the inlaid sentiment is perfect! That is one fun card with those balloons!